“Anyone going higher than 3,000m needs to be aware of the risks of altitude sickness.” So reads the health section in our old and very ‘pre-loved’ edition of the Rough Guide to Chile. The author goes on to explain how the reduced atmospheric pressure at high altitude leads to a corresponding reduction in oxygen. 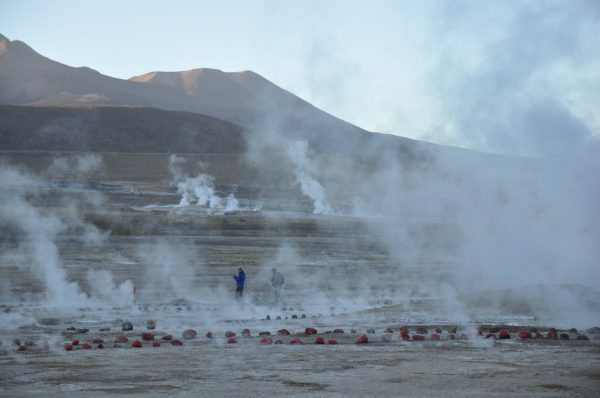 “Don’t be tempted to whizz straight up to the altiplano from sea level,” he explains – because if you do, you’re likely to suffer throbbing headaches, extreme weakness, and nausea. Symptoms can also include numbness on one side of the body, and in this more serious form the malady is actually life threatening. 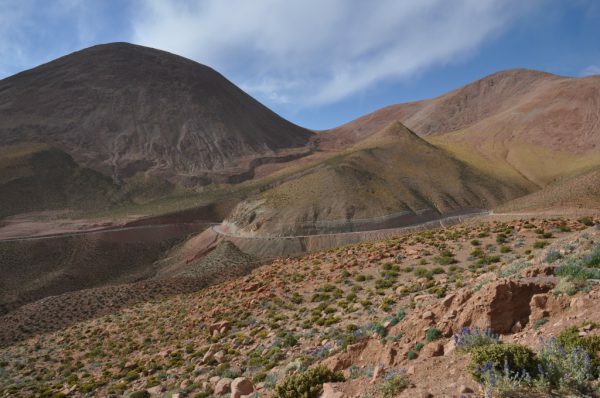 “High altitude cerebral oedema can be fatal within 24 hours.” I read the words aloud to the family as we ascended the valley from Lasana. 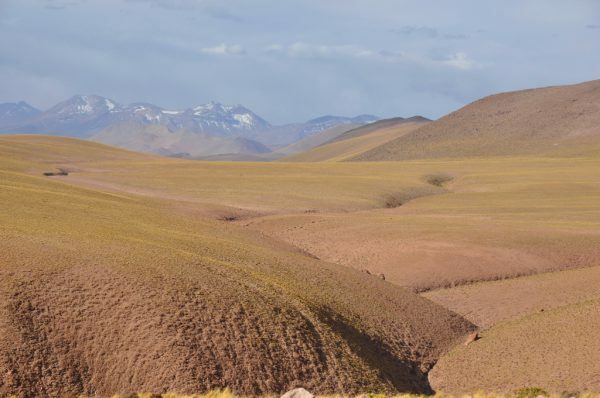 That village, with its ancient citadel, was at a mere 3,000m – yet already I had found myself getting out of breath as we clambered around the ruins. 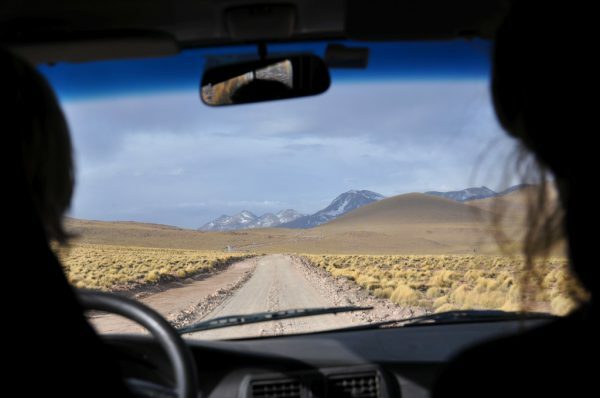 The road which we now followed would take us up to 4,600m. “Only 3,400m… ” Nick interjected. We press on. The road clings to the side of a spectacular valley; and this being Springtime, and it having drizzled quite recently in the mountains, there is actually a dusting of verdure here and there on the scree-covered slopes. 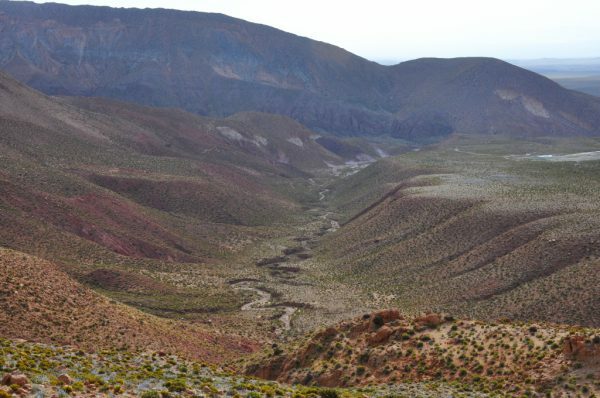 Far below us, at the bottom of a narrow canyon, a dry riverbed twists its way along. No wonder my pulse is bounding. My legs feel heavy as we walk around, and my breathing is laboured. Because the mountaintops are rounded there’s no sense of being on the roof of the world, yet our physical deterioration is not the only clue. The sun beats down, but whereas on the desert plain we were hot, up here the wind is icy. A herd of vicunas strolls past, mercilessly tracking down the merest snippets of greenery and nibbling them out of existence. Now the road disintegrates. Whereas, before, it was surfaced, from here we are following a dirt track corrugated with moguls. The van bounds along like a tin kangaroo. We wait for the track to descend, as per the plan. The sun hops over the hill astern of us, and the air instantly cools to the sort of temperature that hits you when you open the freezer – but the road just keeps on tracking across the wasteland. We arrive at our destination. 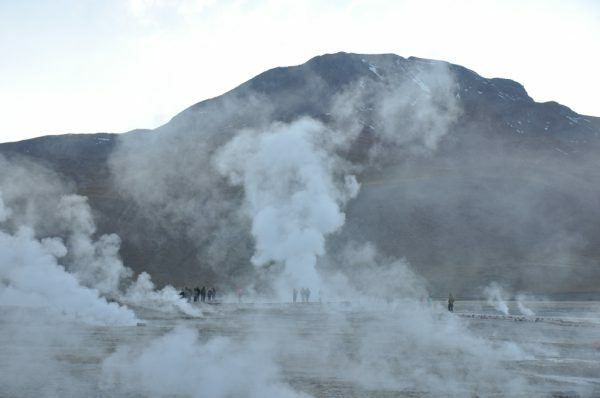 The ‘geyser field’ of El Tatio is a renown tourist attraction. Every morning hordes of minibuses come crawling up the valley from San Pedro, the aim of the tour-guides being to get their punters on the scene before dawn. We, in our cleverness, have decided to beat the rush-hour traffic by spending the night up here. Well – when I say we, in this case I mean me. Mea culpa. It was my clever idea – and thus I have no one but myself to blame when the sun sets and leaves us stranded, still at 4,300m. We pull off the road and pop up the tent. Somebody cooks supper. Not me; I feel far too lame. Darkness descends and we curl up together – and shiver. In the morning we will discover puddles of ice on the road where we rinsed our dishes, but the temperature is not the only thing which makes sleep difficult. Insomnia is another symptom of altitude sickness. I eventually doze off, only to awaken with my left arm completely numb. Then I realise that I’ve been sleeping on my arm. We’re all awake before the alarm goes off at six o’clock. Awake, and shivering. I slept fully dressed, but even the simple task of getting out of my sleeping bag and into my jacket is almost more than I can cope with. I tumble down the ladder and am promptly violently sick. The cerebral oedema was imaginary, but I’m certainly not on good form. “Let’s just go down,” says Nick. 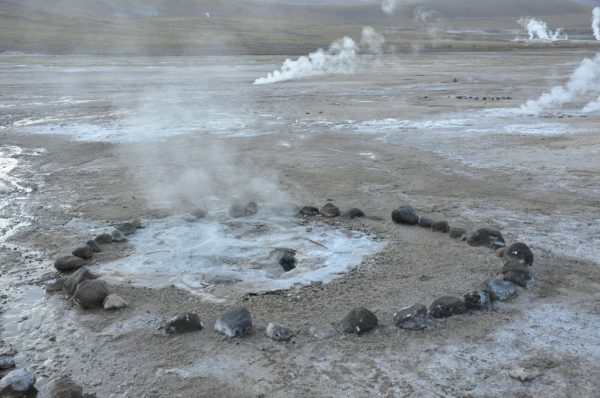 So we roll along the road to the ‘geyser field’. 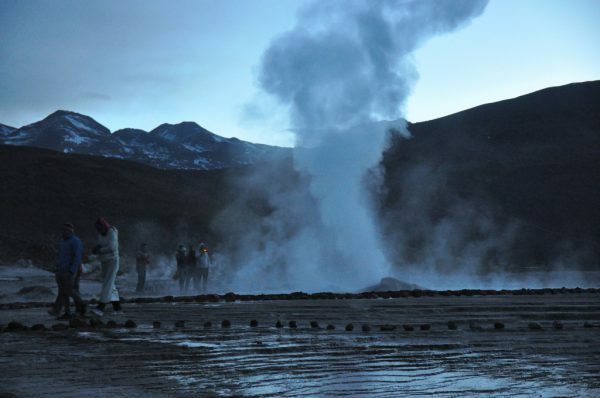 We’re the first to reach El Tatio – as planned – but only just. Within two minutes there are lights flowing up the valley as the caravan arrives from San Pedro. 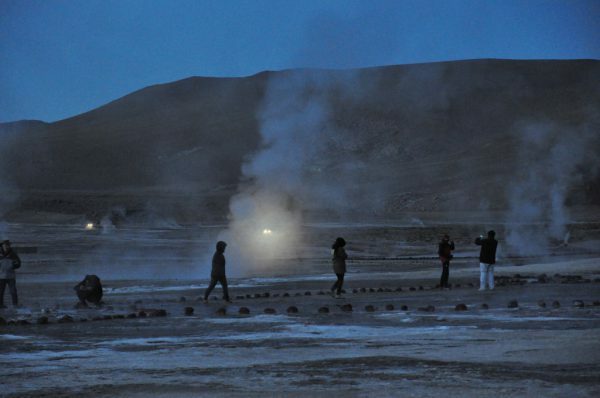 Now, the thing about El Tatio is that its geysers are a bit feeble. 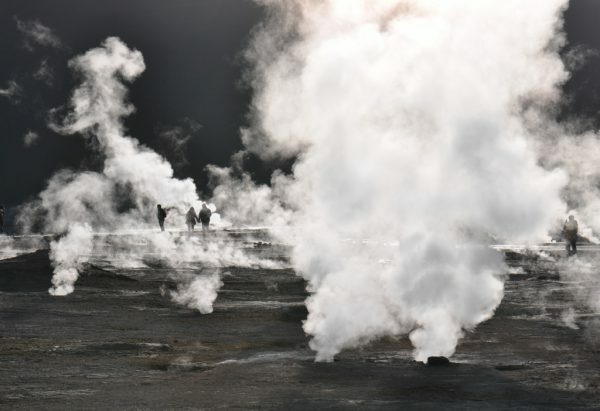 Whereas the geysers in Iceland squirt jets of scalding hot water high into the sky, these ones just bubble. 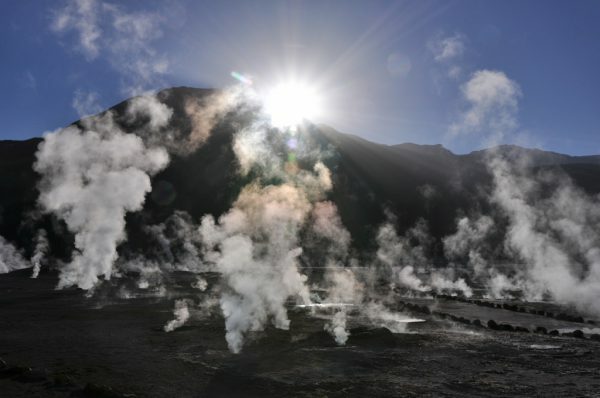 If one were to come upon them by chance, these pocks, puffing out steam, would be an amazing discovery, but as it is they’ve been so hyped-up that a little ‘something extra’ is necessary. The steam clouds are at their most impressive at dawn, and so the ‘extra’ consists in being here at that hour. In fact, it seems to me that the rigmarole of getting up at four and getting on the bus and being ferried up here in the dark has become the main thing. We all ambled around the place, very slowly and lethargically – and I moved especially slowly and lethargically, like an elderly and especially unfit cripple. Every twenty paces or so, I stopped and leant on Nick. Roxanne and Caesar were also walking arm in arm, but that was largely in order to conserve body heat. It was ridiculously cold; after all, down on the plain, in the daytime, the temperature was in the nineties. Dawn was also a ridiculously long time coming. 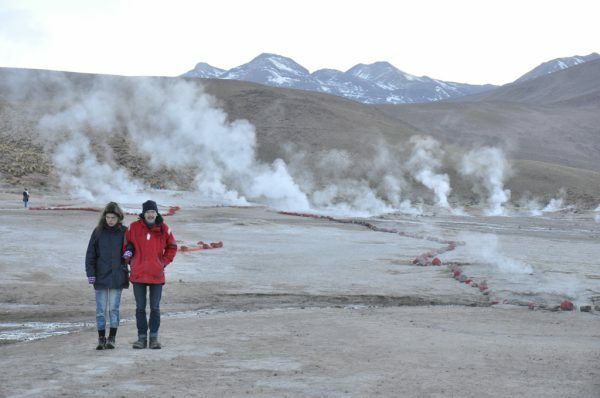 To be honest, El Tatio is vastly over-rated. 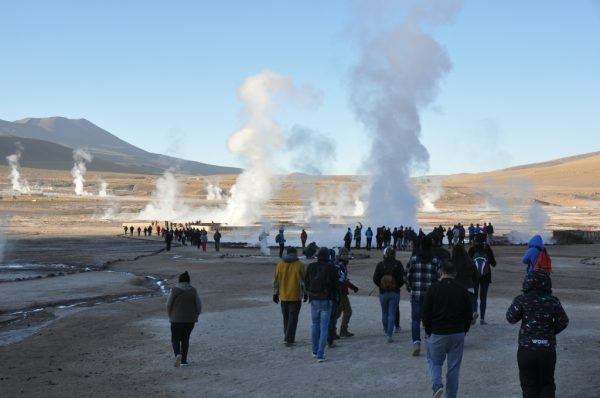 The inconvenience and cold would be a tolerable burden if they bought solitude – but, of course, if one comes here at the golden hour one has to share the geyser field with 300 other sightseers. Everybody is shuffling around like zombies, so that the place nevertheless retains the sort of quietude otherwise only found in a cathedral; however, a large congregation, however docile, requires an element of Crowd Control. The control takes the form of paths whose borders are marked with red-painted rocks. 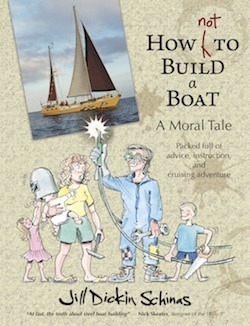 There is no doubt that the paths are essential – they save the visitor from stumbling through the thin crust and into a pond of scalding water – but they certainly do nothing for the ambiance. The sun threw a beam of light onto the mountains behind us, and then he slowly marched across the landscape towards us, painting colour onto everything and bringing it to life. And eventually – finally! 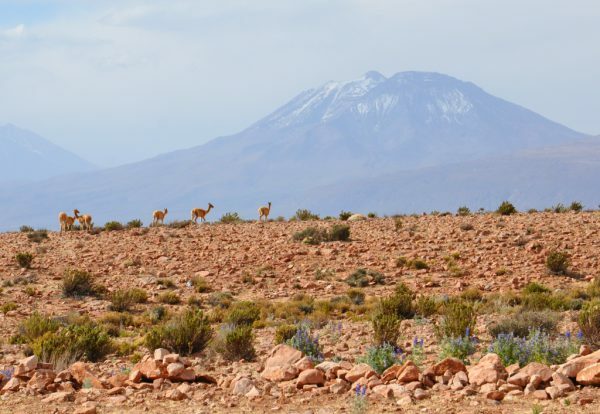 – he deigned to peer over the tip of the mountain overlooking El Tatio and glare down upon us. Those tour operators need to organise a bugler, because that was all that was lacking: a fanfare as the spotlight blasted through the dancing columns of steam. Instead, the guides boiled kettles in the car-park and fed breakfast to their customers. Then the vans all poured away down the valley – and we followed. 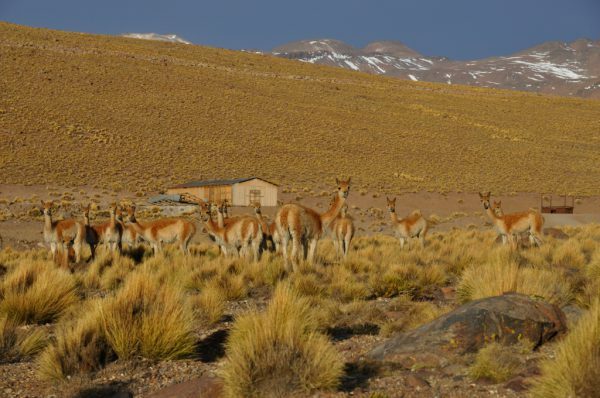 The route took us past various interesting features – a flock of vicunas; a narrow gorge overlooked by tall cacti; a lake, hidden amongst the hills, and home to flamingoes. On each occasion, the caravan halted and the tourists leant out of the minibus and took photos. We had a definite advantage, being in our own vehicle and being therefore able to get out and wander around at will. At one point the road stumbles upon a sudden green swathe next to a stream, and here we found a small herd of multi-coloured llamas. Each one had a tag on its ear, but there was no need of any fence to keep the animals penned in. The grass was prison enough. Soon, the minibuses were all far ahead of our Wicked van. Presumably they were needed to take other people to other venues in the afternoon. 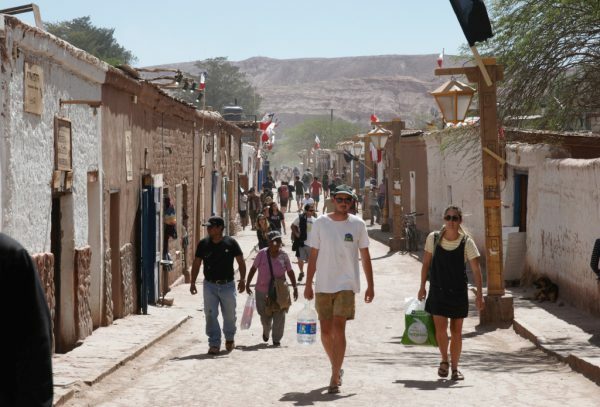 We bounced down behind the throng and eventually reached the sprawling village of San Pedro de Atacama. Half an hour was more than enough time to let us know that this place held nothing for us. The little adobe houses at its heart are no longer home to Atacamenos. Each and every one is owned by tour companies and restauranteurs, and the name of the game is simply to part visitors from their money. The place reminded me of the Canary Islands. We had no need of transport, no need of food, and no need of a place to sleep. We were self-sufficient. We sailed our ship out onto the Atacama salt-pan. And there we spent the night, all alone under the big sky.